In the results from four reporting periods, the SFS established 600 violations of the requirements on reporting deadlines and the completeness of the reports on CT. Therefore, taxpayers were fined EUR 8 million, of which 55% was actually paid to the state budget of Ukraine. 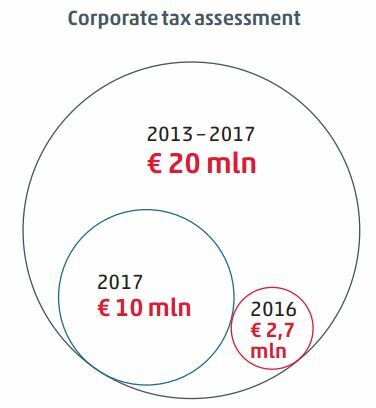 In 2015–2018 the SFS started 58 TP audits, 34 of which have already been completed, resulting in the corporate profit tax assessments presented in the graph here. 430 taxpayers performed self-adjustments of transfer prices and increased their taxable income or reduced losses from controlled transactions in 2013–2016 by a value greater than EUR 443 million.